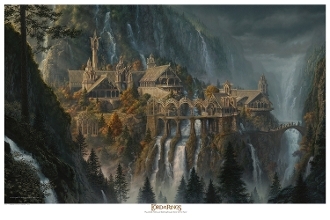 Rivendell:The Last Homely House East of the Sea. Officially licensed Fine Art with Warner Bros. Studio, this is the first in a series of various landscapes throughout the realm of Middle Earth. This Fine Art Paper Giclee comes in three sizes, 16 x 24, 24 x 34 and 24 x 36 inches. This PAPER GICLEE utilzes Breathing Color's archival "Pura Velvet"archival paper. Comes signed and numbered by the artist with Certificate of Authenticity. Paper Editions are limited to 2000 pieces worldwide for each size. We ship all over the world. Please include your phone number for shipping reference. Please note that international buyers are responsible for any import fees, or taxes. We use heavy duty shipping tubes to ship our items. Let us know if you have any questions about this item.